The only way to understand mathematics is by doing mathematics. The reader will learn the language of axioms and theorems and will write convincing and cogent proofs using quantifiers. Students will solve many puzzles and encounter some mysteries and challenging problems. The emphasis is on proof. 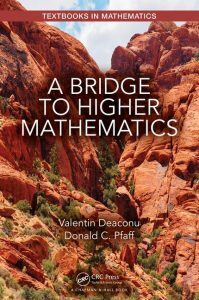 To progress towards mathematical maturity, it is necessary to be trained in two aspects: the ability to read and understand a proof and the ability to write a proof. The journey begins with elements of logic and techniques of proof, then with elementary set theory, relations and functions. Peano axioms for positive integers and for natural numbers follow, in particular mathematical and other forms of induction. Next is the construction of integers including some elementary number theory. The notions of finite and infinite sets, cardinality of counting techniques and combinatorics illustrate more techniques of proof. For more advanced readers, the text concludes with sets of rational numbers, the set of reals and the set of complex numbers. Topics, like Zorn’s lemma and the axiom of choice are included. More challenging problems are marked with a star. All these materials are optional, depending on the instructor and the goals of the course.